Okay, this was not going to be about booze after all. 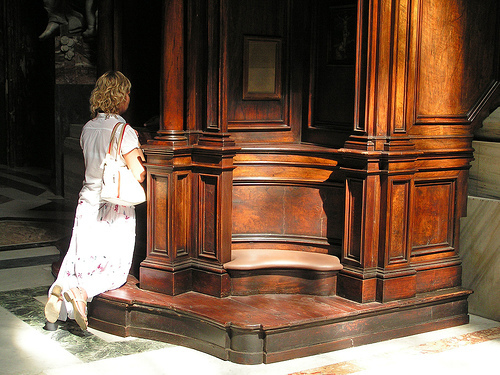 I realized that the subject of Confession was, to him, foolproof against Catholicism and he was going for the gold. I decided to help him out. “You mean because only God can forgive sins?” I said. “Yeah!” he said. She walked right into it! So I told him about how Jesus had actually given the power to forgive sins to men. Mere men! Then I explained that it wouldn’t do for the rest of us to miss out on having our sins forgiven just because we were born too late to meet the apostles, so they passed on the power of the priesthood to others. Then those people passed it to others and they passed it to others right down to this day. “Like from father to son?” he said. “Yeah!” I said. He walked right into it! It was then that I realized that catechism – even Bible based catechism – would get me no where. But why let that stop me? “I am a sinner,” I said. “I am too,” he said. For a brief moment, we shared something. We bonded. We were both in the same club. It gave us a warm, friendly feeling until I asked: “So what exactly are your sins?” He seemed confused by the question. That is one reason why Jesus gave us Confession. He wanted us to confess our sins to a man. Jesus knew that human beings are masters of self deception. Without specifics, we might never know how ugly sin is. At best, we might think it makes us down to earth. At worst, we might think it’s just something that makes us feel unpleasant, something that embarrasses us. We might blame it on other people. We might have some abstract notion that it offends God but we would hardly get riled up about that. God can take it, right? We only get riled up when we are offended. Jesus wanted us to get riled up about sin, our own sin, and to know exactly how it offends God and other people and then to receive His forgiveness through the ears and lips and hands of a fellow human being. *Specifics are fictional and bear no resemblance to sins of persons living in my house and using my toothbrush. This article originally appeared in the National Catholic Register.